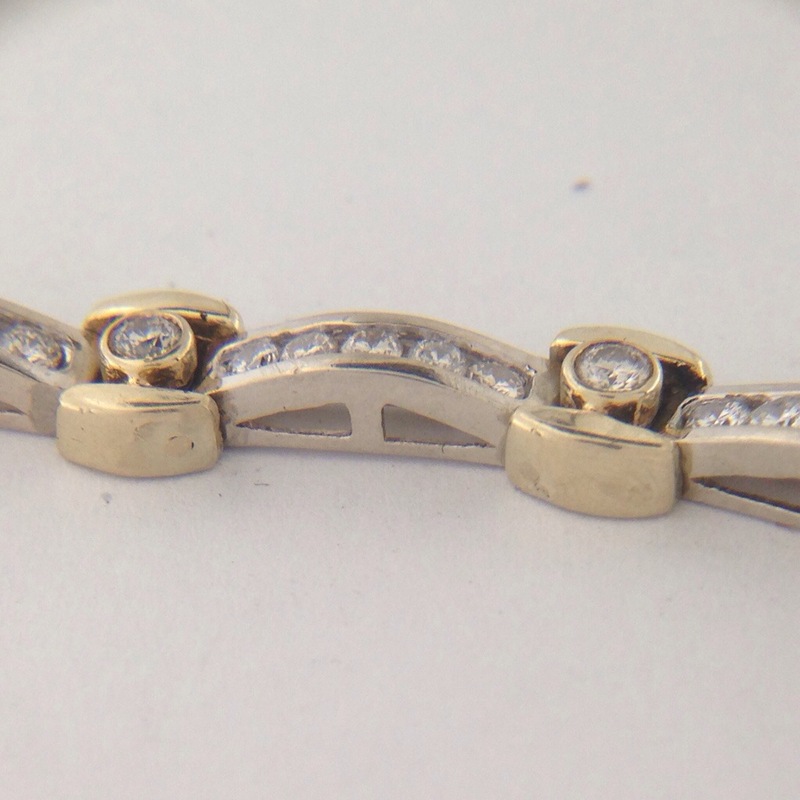 Tennis bracelets often come in for repair. The rod part of the tube hinge is usually the part that breaks. The wire has to drilled out and replaced. The tube counter part usually shows wear too, so it is best to build that up while it is apart. Here is shown the drilled out wire and rebuilt tube before soldering in a new rod. The wire is soldered in place, sanded and polished to complete the repair. Here is a picture before the final polish. 4 hinges were rebuilt on this occasion. 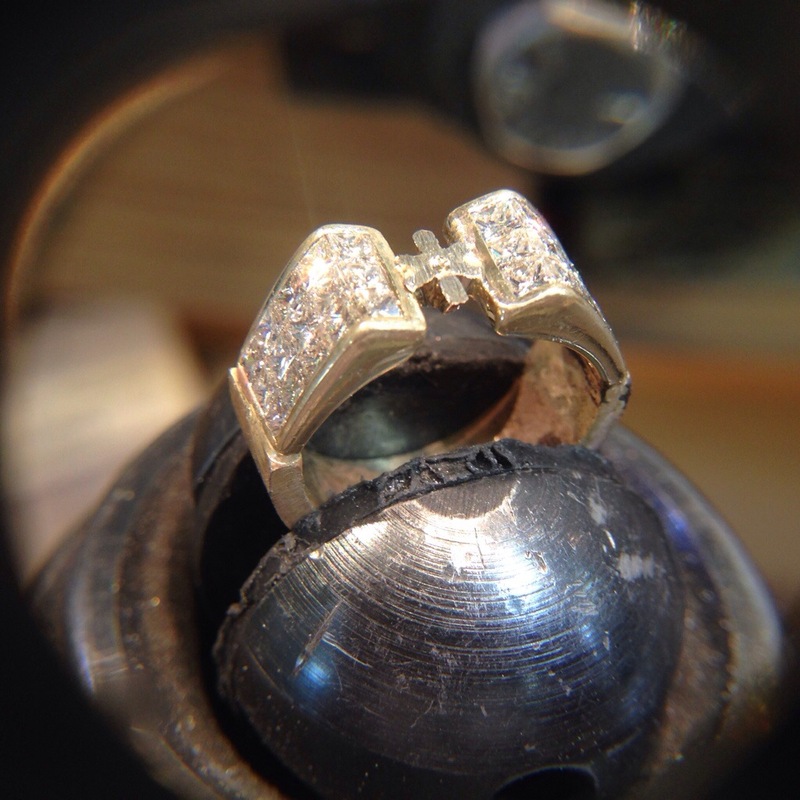 Rebuilding emerald cut shaped half bezel. It seems like I have had a lot more channel rebuilds lately. Maybe because we’ve been showing off some of the latest ones to people and they have been going home and bringing back theirs in for work. 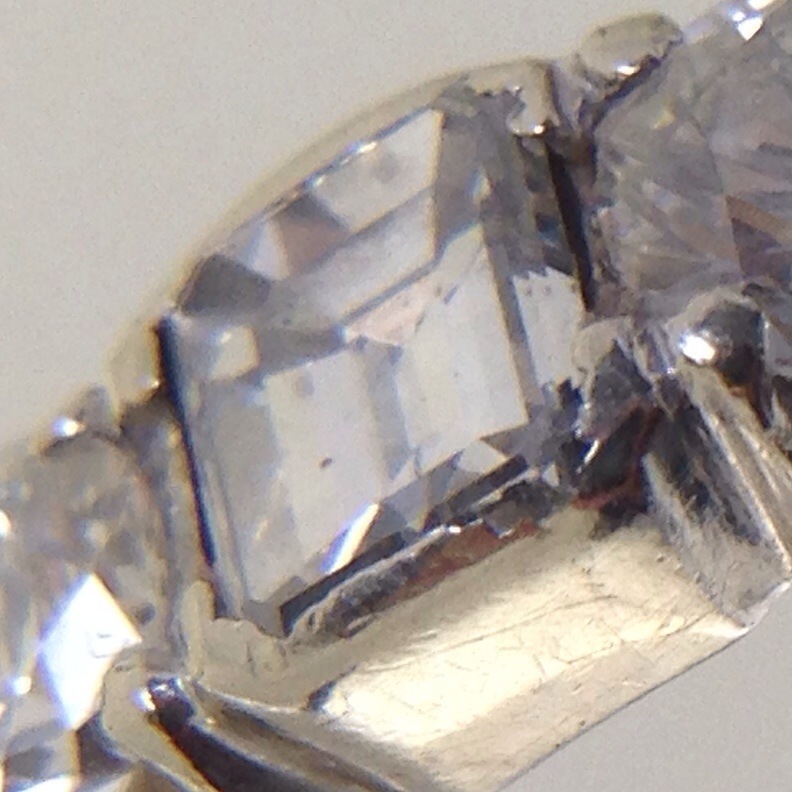 The half bezels holding in the big emerald cut diamonds were quite worn and thin. I rolled some wire flat in the rolling mill and gave them a custom bend to match the stone. I laser welded them in place. I made them a little over sized on purpose so I had metal to shape, sand and polish. One stone rechanneled, one more to go. 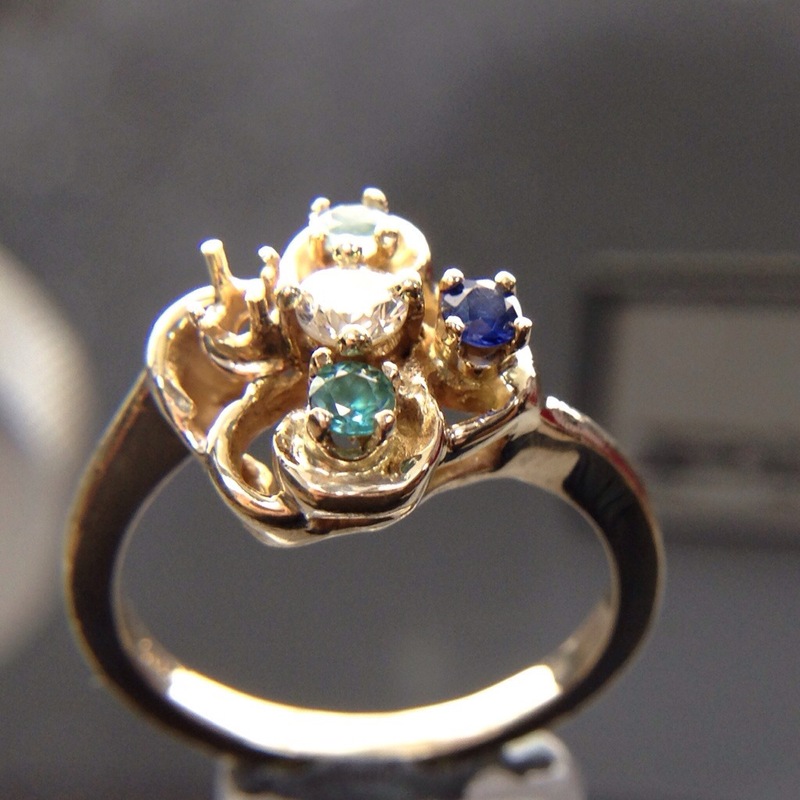 It is a beautiful ring. It is such a tasteful design. Now that I was able to refresh it to when it was new it can be worn and enjoyed for more years to come. 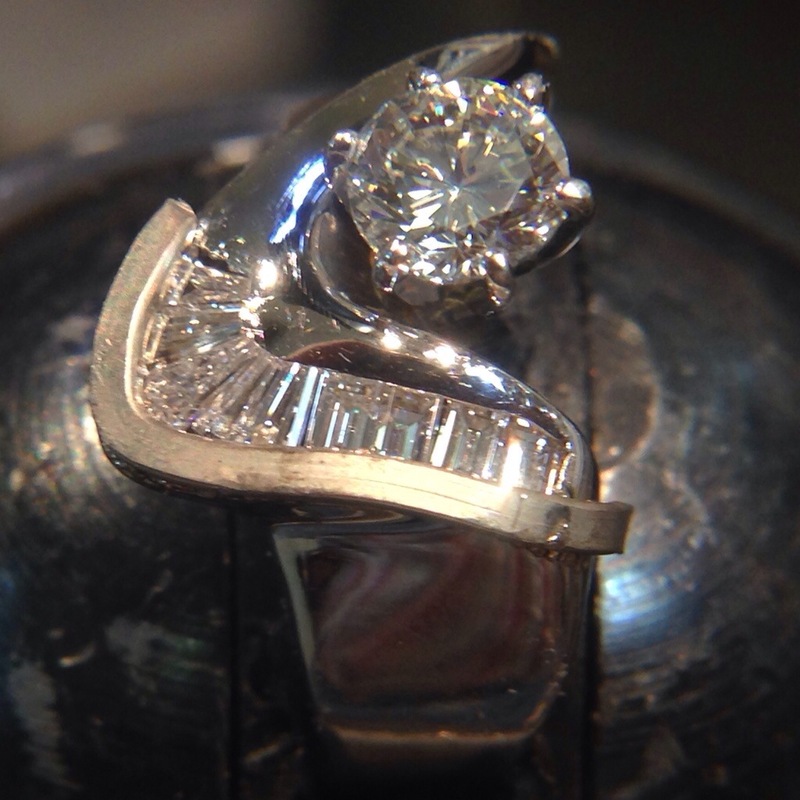 New halo and full shank for ring. I wish I had a “before” picture of this ring. 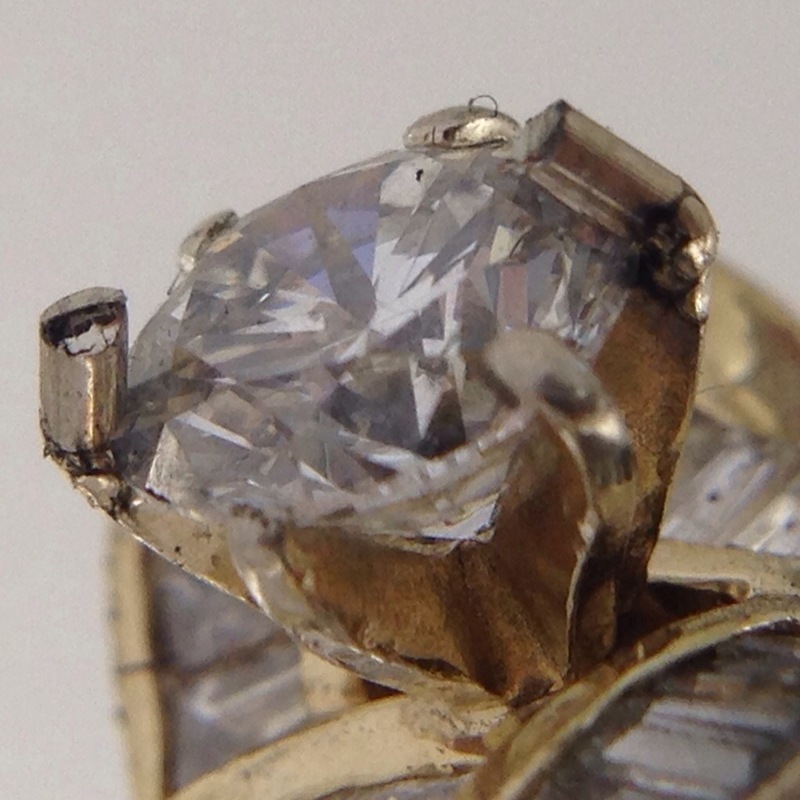 This ring has some sentimental value but was well worn. It had a number of issues and was worked on many times before. It was in need of a new shank and the marquise needed a little updating. I carved a wax for the new shank, cast it and used it in the repair of this ring. That far was better then making a large ingot and rolling it out in the rolling mill then cutting away a bunch of metal to make the nice taper. 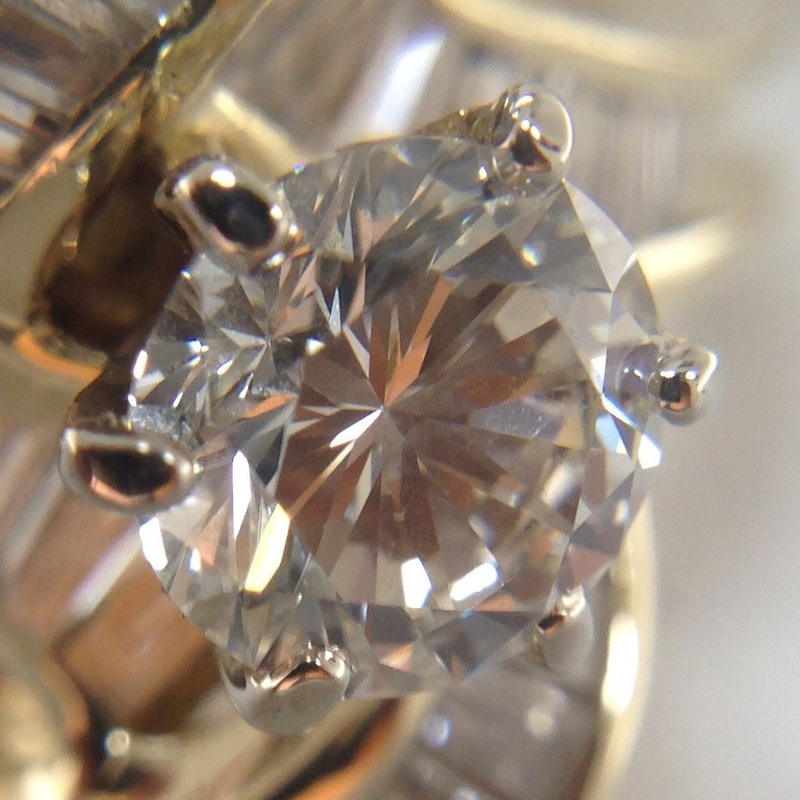 There are not a lot of options for marquise halo style heads out there. I suppose it is because of the too many variations of length to width proportions that marquise have. I spent about an hour and a half carving and tweaking the wax using my bench microscope under 4 power. 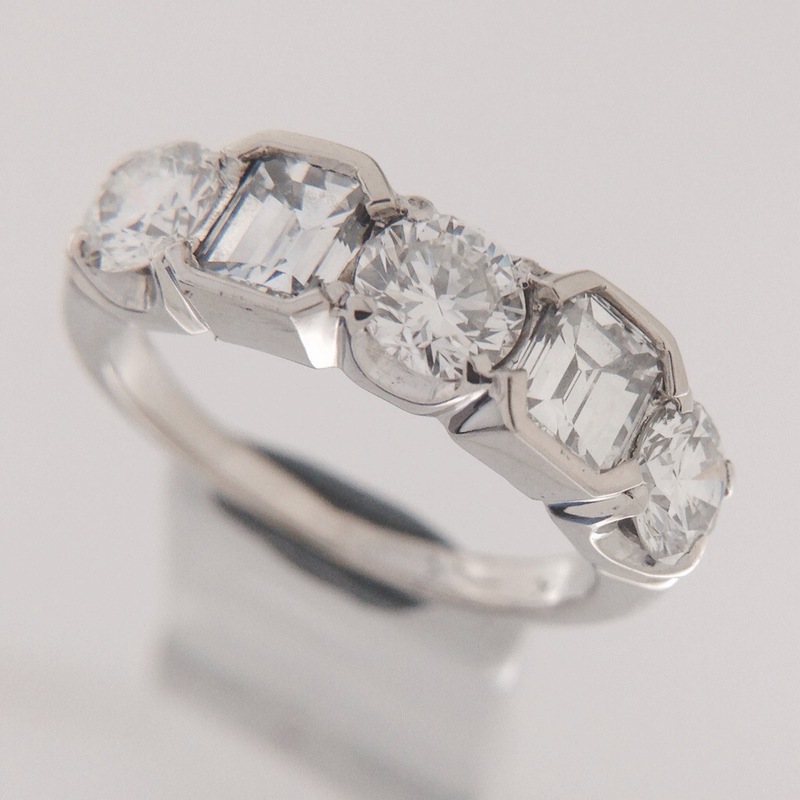 It was time well spent— the stone setting went very smoothly. 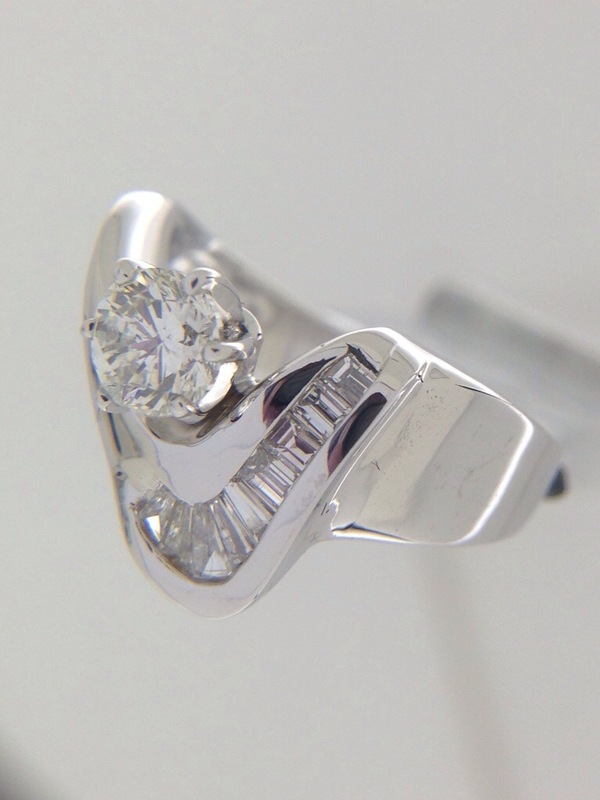 Bead set side diamonds of a halo can have an antique look to it so I gave it a simple profile to help it go with the more modern invisible set princess cut diamonds of the mounting. I did not like the way the basket head that I ordered looked in the halo. It raised the marquise up too high. So I fabricated my own head so the diamond sat just above the halo. The original peg head was a little out of proportion for the wide ring. The nice stone got lost. The new halo gives the center stone some real presence. 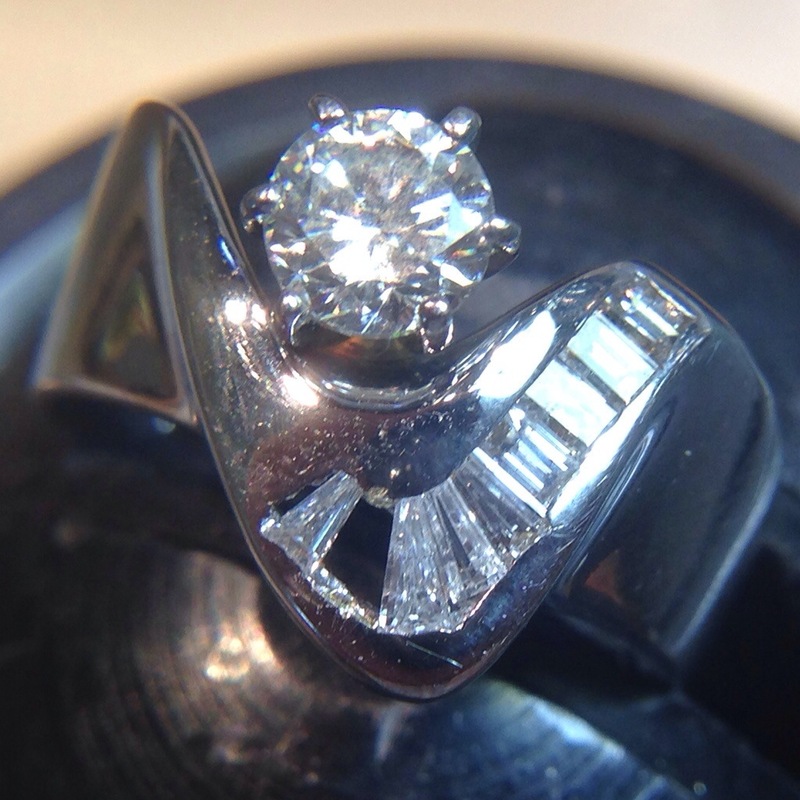 A lot of different types of repair technics were used to give this ring a new life. And the fact that the work done to it is hard to pick out makes it even more satisfying. The ring is now well proportioned and updated. The shank has the heft it originally had. I think it all came together well. Here is another channel rebuild. 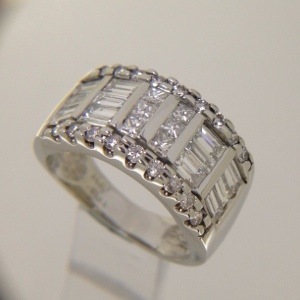 This time on a diamond ring. The metal holding in the baguettes was thinner than paper. It was so crooked and jagged. I found a tapered baguette to fill the hole. I rolled a gold wire and carefully formed it to the ring and laser welded it in place. Then I flowed solder to fill any gaps. I sanded, polished, refinished and rhodium plated the ring. The six prong peg head was in relatively good shape except for two prong tips were completely sheared off. I had concerns that the diamond was enhanced. Any retipping with a torch could potentially damage the fill material. I opted to use the laser. I fashioned the end of a 14k white gold wire to an angle so the diamond’s crown facet and wire would be in full contact. If I were to weld the wire straight up and use pliers to bend the prong in place to secure the stone, I believe that the new tip would break off now or later if stressed. It seems that weld joints are not in the annealed state and tend to be a bit more acceptable to breakage if worked. 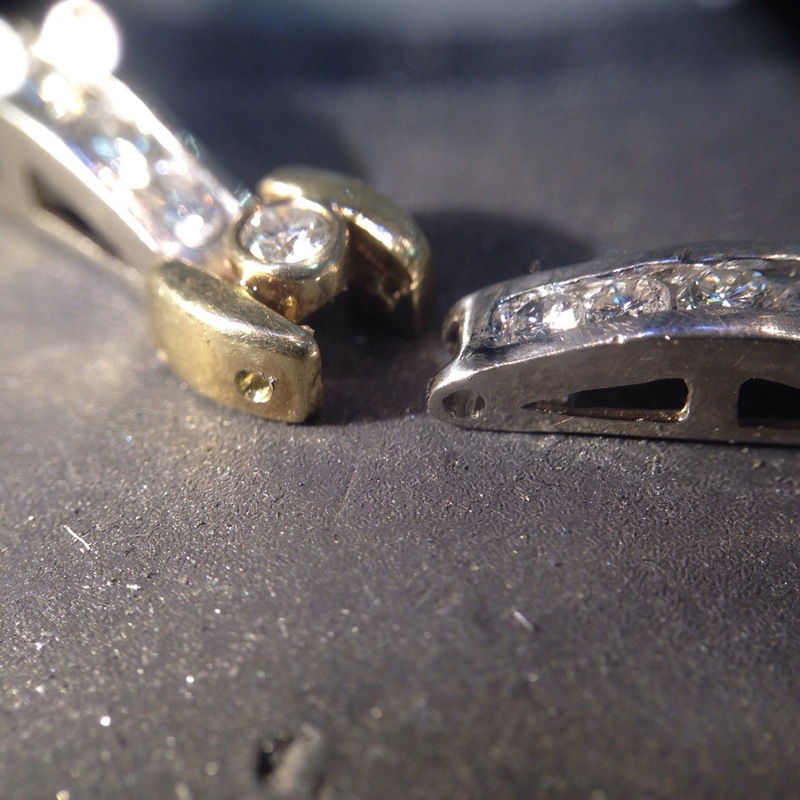 The new tips were filed and shaped with a cup burr to match the others and the ring was refinished. 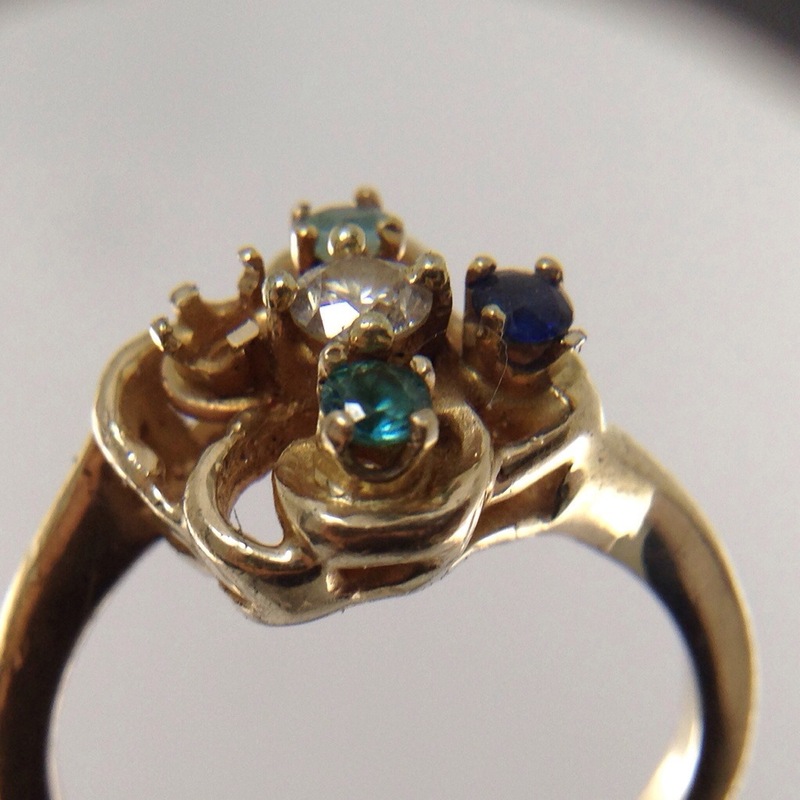 There is a wonderful back story behind this family ring. After 10 years of marriage and the addition of 2 children, they decided to have the wedding ceremony that they never really had. Their son was the ring barer and their daughter, the flower girl. 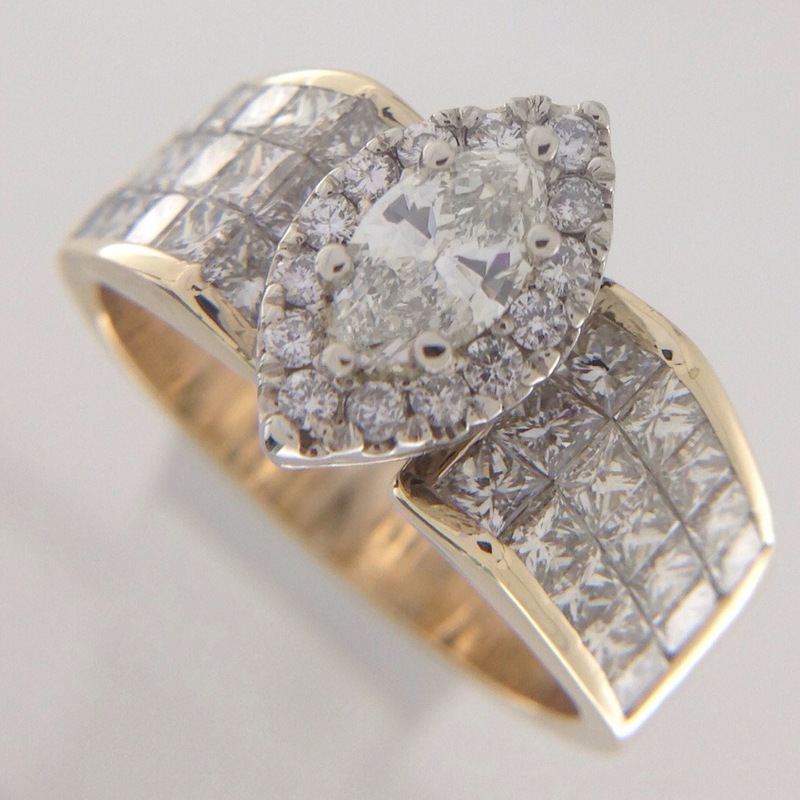 And this was the ring presented to her on that day. (Not in the condition pictured). 😉 It contained hers and his birth stones, a diamond in the center to represent the 10th year anniversary and a pink and blue stone for their two children. She admitted that it has been in this state for about a year and a half when I ran into her at the bank. 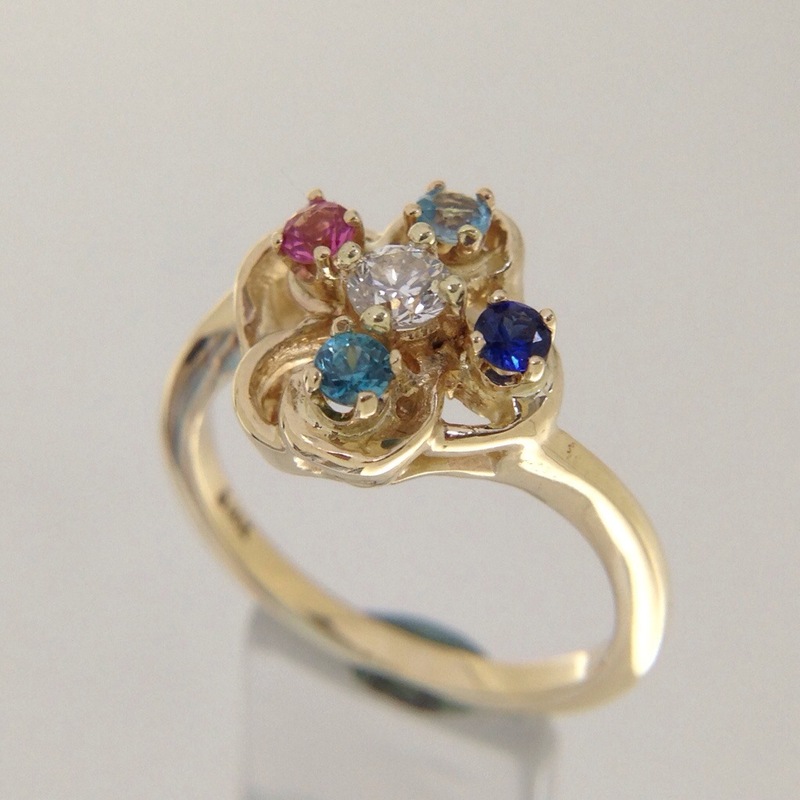 The ring was missing a few prongs that led to the loss of the pink tourmaline. And the sapphire was is need of a prong tip. I told her that it was not too big a deal to fix. Not too expensive. 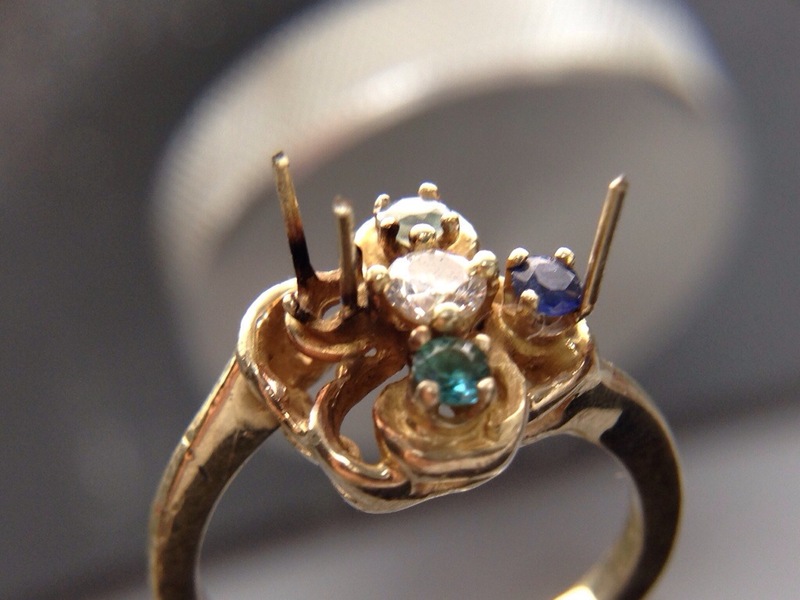 I laser welded on 14k yellow gold wire to act as the new prongs for the pink tourmaline. I hit the seam a few times with a strong beam at 0.3mm then opened up the beam to 0.9mm where it literally shines the surface. Very little polishing required. I covered the blue sapphire with a putty that watch makers use to remove finger prints and dust from inside a watch dial and crystal after being worked on. The putty helps protect the stone from any stray laser light as I was welding the prong with the stone still in the head. I dressed the sapphire re-tip and set the pink tourmaline. 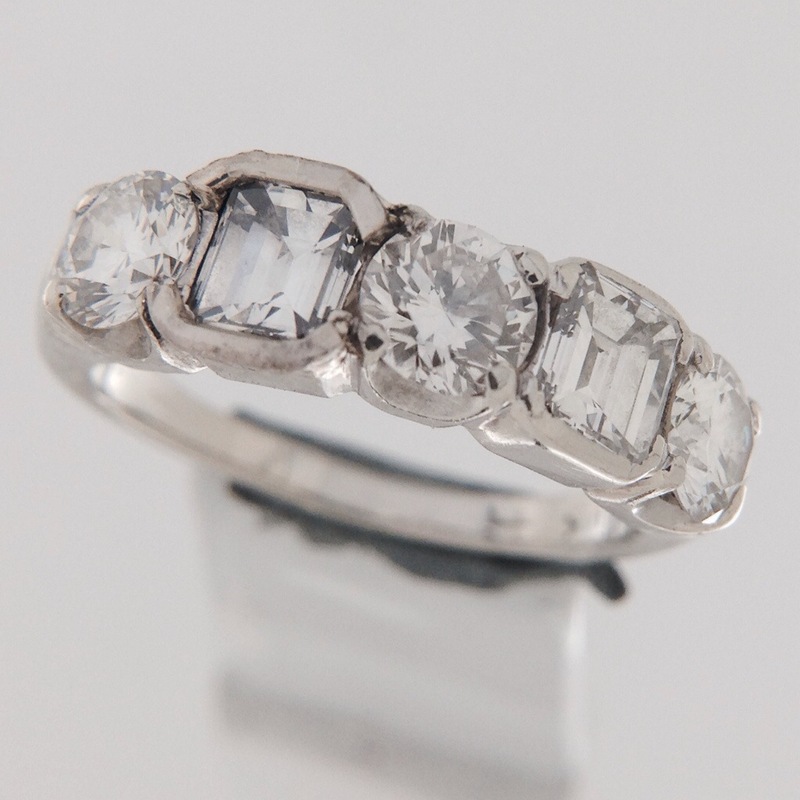 The ring was completely burnished to remove dents and dings and was lightly sanded and polished to the day that she first got it. Almost a redo. 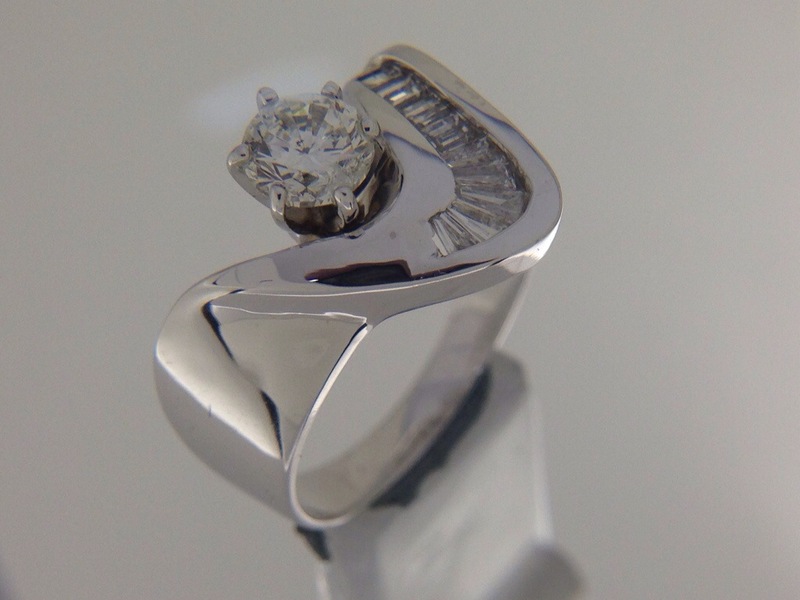 Reworked ring. 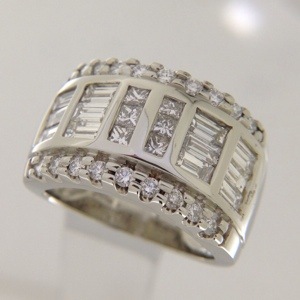 This ring was blogged about a few weeks ago. 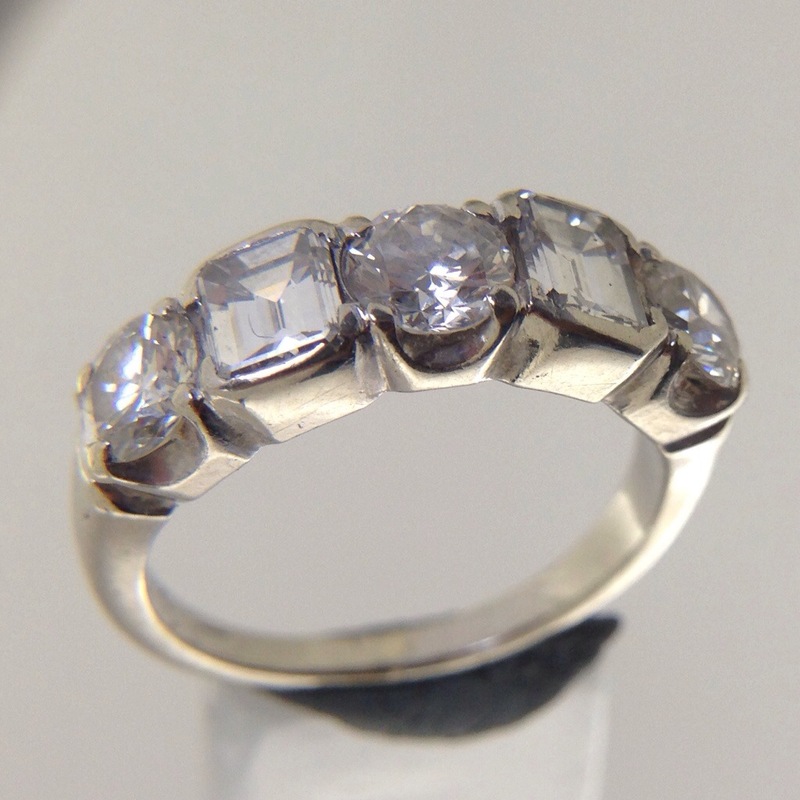 We made this remount ring for a customer duplicating the three separate rings that were soldered together. 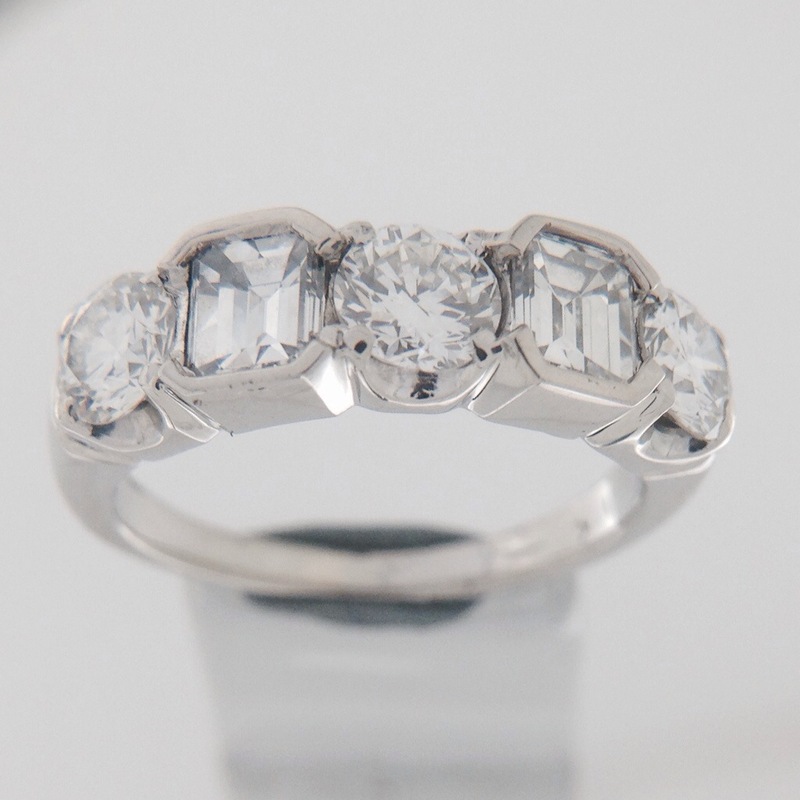 The center ring was a beautiful invisible set princess and baguette ring that was having the typical issues with continual stone loss. We kept the basic design of the set, but channel set the stones instead of invisible setting. 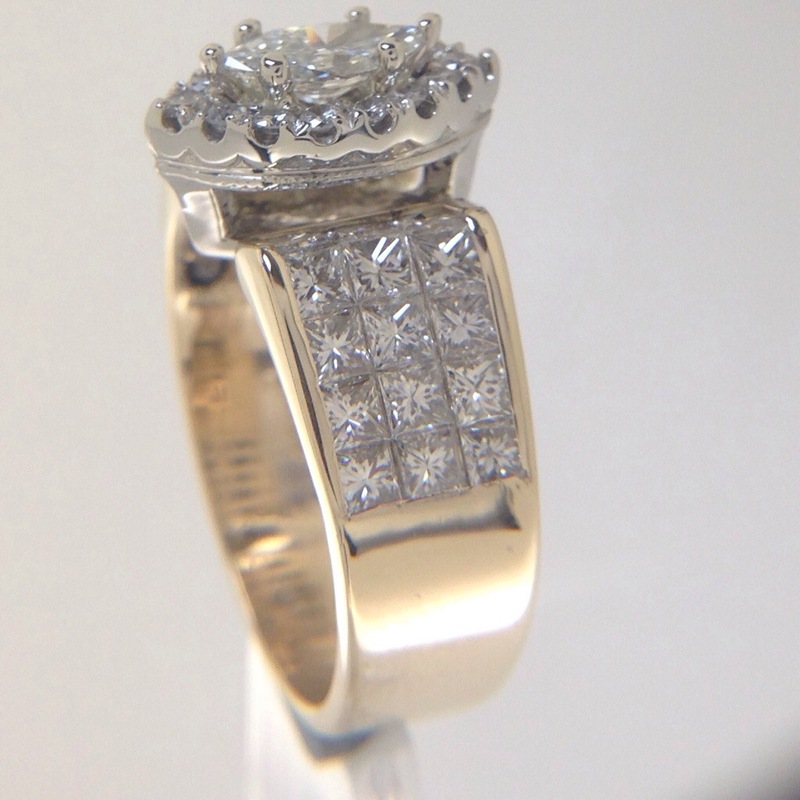 The prong set round diamond bands were integrated in the new ring. 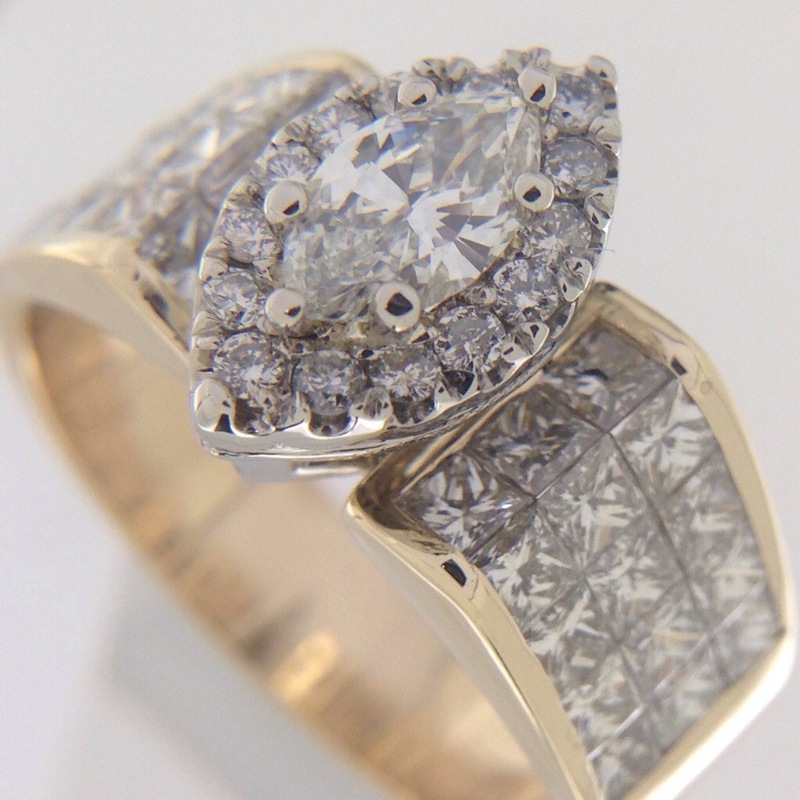 The original ring had very little metal around the invisible set stones as compared to the new ring, so after it was done, the customer felt that it seemed just too bulky, from what she was used to, with all the channels of metal. This should have been addressed in the wax model viewing part of the project. It can be hard for some people to envision the design even with the actual wax, 3D model in their hands. I think that some people have a hard time because they are seeing a nonmetallic (non-reflective) piece of hard colored wax. Our goal is to always do what we can do to please our customer. That is why they come to us. 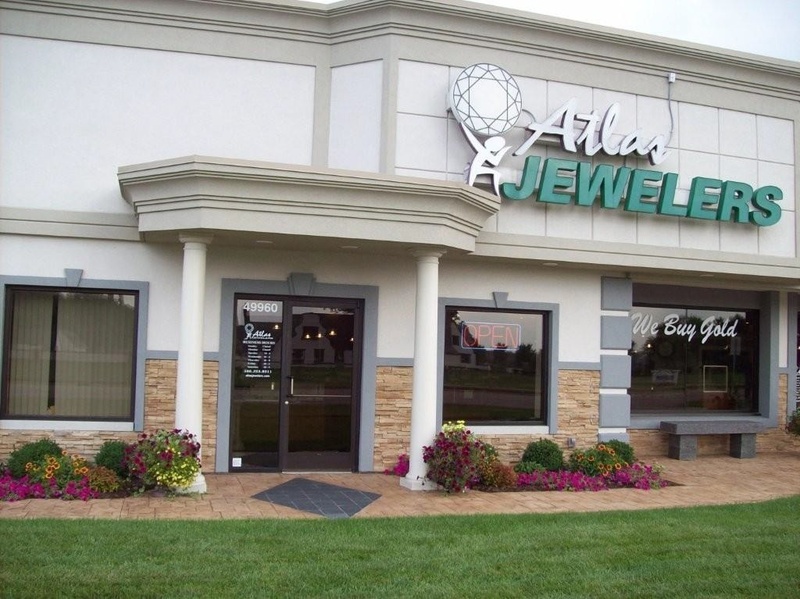 There are many jewelers to chose from. What good is being highly skilled and caring about craftsmanship and value if customers walk away dissatisfied because of a misunderstanding? The first sinking feeling was that there was no way to make these major changes that did not include remaking the entire ring. I came up with a plan to try a big modification first. I cut the ring into 3 pieces. 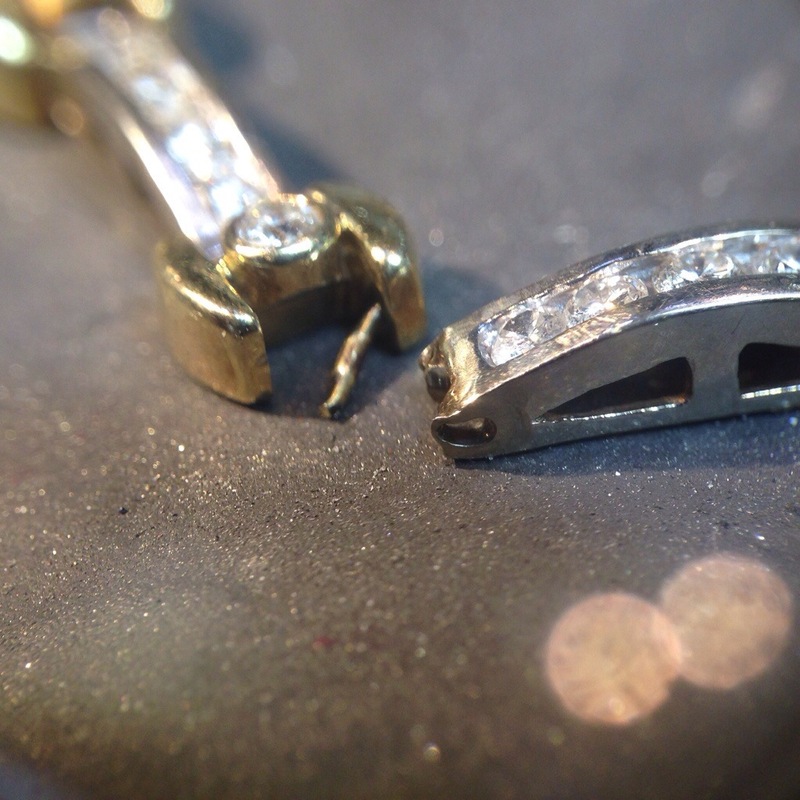 I filed and sanded out the strip of metal between the round diamonds and the channel set stones. The customer asked that the outer bands should be more at the same level as the center section, so I welded the center section a bit lower. I am proud to say that all the modifications were done as welding, either with the torch or the laser. There is no solder used on this ring. The ring turned out great. The before looked great too. But now she has the ring that she wanted and we got to do it for her. Took a little more work to get there, but it was worth it.